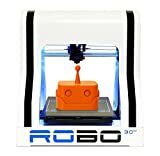 • Starter spool of 300g of ROBO Blue Filament The R1 3D Printer by ROBO 3D is designed to help you begin 3D printing quickly and easily right out of the box. Follow alongside our getting started video with your 3D printer and you will be set up in a matter of minutes. Then you can begin choosing items from our FREE Library of files included in the software, search online for files to download and print or being making your own files and print them in our software. It’s that easy.